I'm working on a Clapotis in Knitpicks Shimmer held doubled and I'm nearing the end of the first 2 balls. I originally wound the skeins into center pull balls by hand (since I don't have a ball winder or swift) and now they're both a giant knotty mess. Last night one of them even broke on me. argh! 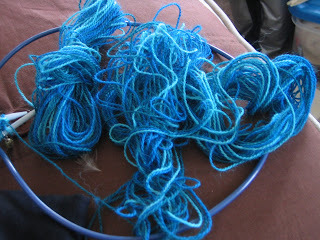 Even with center pull balls wound on a skein winder, I'm always fighting knots. I think from now on I'm going to wind skeins into non center pull balls and pull the yarn from the outside. I don't really care if they end up rolling across the floor, I'll figure something out some way to deal with that.